Recently I saw many ramen shops having “KEISUKE” on their names. 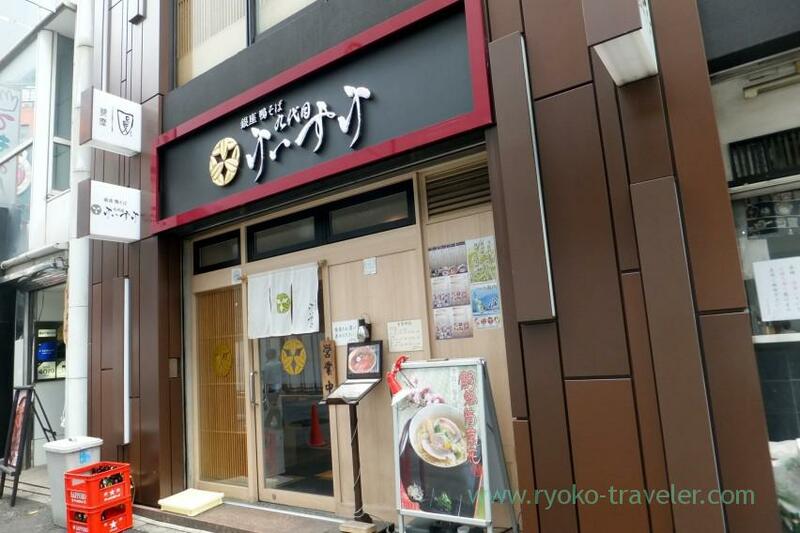 This shops were founded in Keisuke Takeda who trained at French foods restaurant and Japanese foods restaurant. Now there many branches not only in Japan but also in Singapore. They are expanding ! I visited one of the ramen shop by Keisuke in Ginza area this time. The shop’s name is Kudaime Keisuke. “Kuedaime” means ninth. Yes, this is the ninth branch. Now I said there are many branches of Keisuke. But every branches don’t serve same tastes. Every branches have their original tastes. This “Kudaime Keisuke” use duck. Kudaime Keisuke is located at the back of Ginza Six that has been open since 2017 and it’s close to Higashi-Ginza station (Toei subway). This street is like “ramen street”. There are many ramen shops. For example, “Mugi to Olive”, “Jangara ramen”,”Tokyo Aburagumi Sohonten” and so on. Also there’s “Ito” that is popular as dried sardines soup ramen at the back of street. Menu. Duck ramen is their specialty. There is a menu outside. Now I said there are many branches of Keisuke. But every branches don’t serve same tastes. Every branches have their specialty. 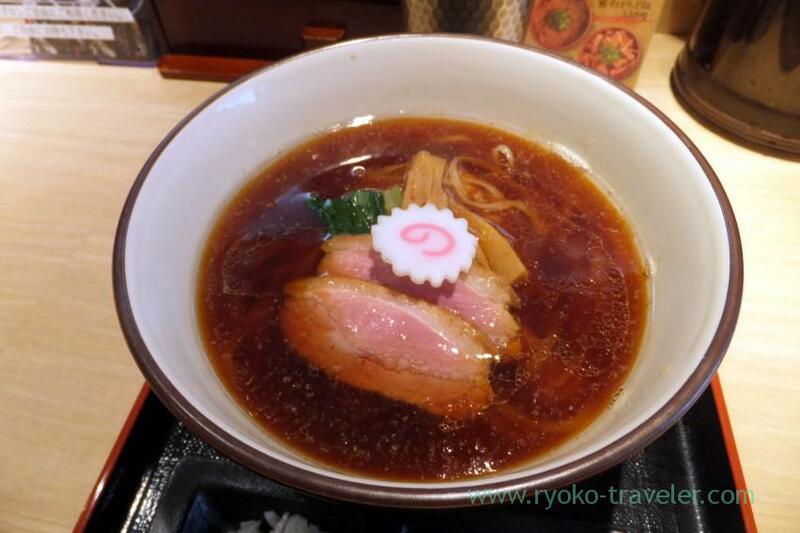 Kudaime Keisuke serve duck ramen. There are two types of duck ramen having duck broth. Duck soba (Clear soup having duck broth and fat) and Kamo Paitan. Kamo (鴨) means duck in Japan. Kamo Soba (鴨そば) is clear soup having duck broth and fat. Prices are higher bacause they use top quality duck for their soup. 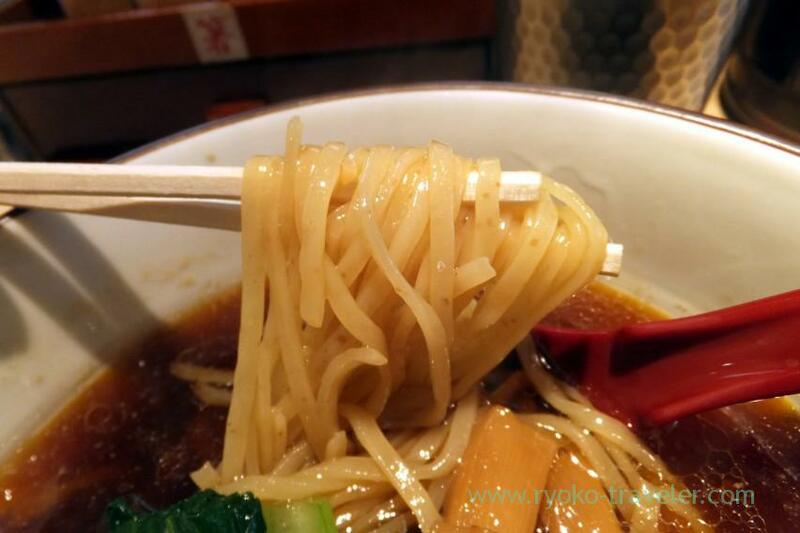 The most inexpensive ramen having soup is simple Hojun Kamo soba (芳醇 鴨そば, 900 yen). 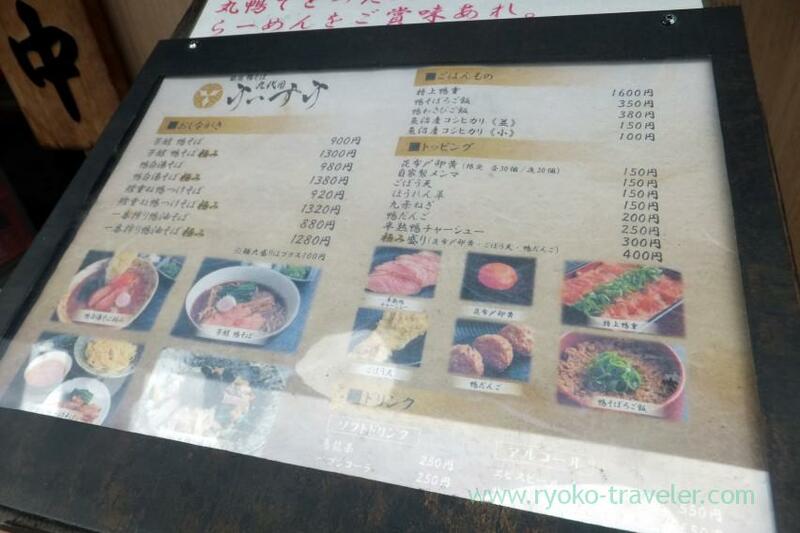 And also they serve ramen without soup named Kamo Aburasoba (一番搾り鴨油そば, 880 yen). Do you know aburasoba? Aburasoba is ramen dressed with oily sauce without soup. Duck fat is used instead of oil for their aburasoba. It looks yummy. It’s the most inexpensive food in the shop. There’s a ticket vending machine in the shop. There’re some counter seats and tables. It seems not ramen shop. It looks like Japanese fancy restaurant called “割烹 (kappou)”. There’re two slices of roasted duck meat by low temperature heating, bamboo shoot, naruto, spinach on it. It’s not ordinary noodles. This flat noodles have so springy texture. It’s like Korean style cold noodles 🙂 The noodles dressed with the soup is delicious. As you see, the soup have plenty of duck fat. There’s black shichimi pepper, sansho pepper and yuzu shichimi pepper on each tables. Those pepper add refreshing taste to this ramen. Open / 11 a.m. – 3 p.m., 5:30 p.m. – 11 p.m.
Saturdays / 11 a.m. – 11 p.m.
Sundays and another national holidays / 11 a.m. – 10 p.m.